…But we think it’s much warmer. My thermometer claims it’s nearly 10.5. Winter swimmers will understand the difference. Once it gets colder I like to know the temperature, partly I feel it’s safer, having an idea of the actual temperature, because my skin finds it hard to distinguish between the sensation of ‘cold and wet’ and ‘really really cold …and wet’. For some reason the duck shaped thermometers always seem to read low, but as long as you are used to adjusting for duck pessimism it doesn’t matter what thermometer you have if it’s the same one each time. 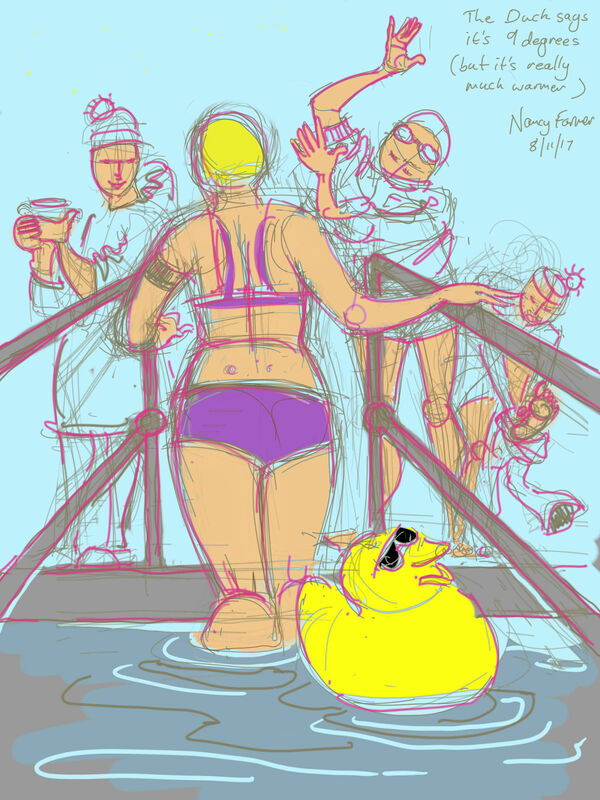 This entry was posted in digital, showcase, swimming and tagged art, cold water swimming, digital sketch, drawing, duck thermometer, thermometer, winter swimming on November 8, 2017 by Nancy Farmer. The leaves had begun to fall, and so had the temperature. This entry was posted in digital, showcase, swimming and tagged art, cold water swimming, Cumbria, Derwent water, drawing, Lake District, outdoor swimming, Ullswater on November 3, 2017 by Nancy Farmer. It helps to know when the school holidays are, if only because the traffic is different and sometimes everyone heads to the coast all at once. However, this was a peril I had previously overlooked. On Monday morning The Great Crab Release occurred. At a still relatively toasty 11.5 degrees in the lake, changing back into warm clothes would otherwise have been safe and simple. It was nippier than expected! By chance, I wasn’t the hapless swimmer exiting the water: I was the one running around with a camera saying ‘Oh Look! Crabs!’ and taking photos of them. It was an impressive haul, the crabs were conscientiously counted out of the bucket and there were over 30 of them, caught in little more than half an hour. They are back in the marine lake now, but some of you may not wish to know that. 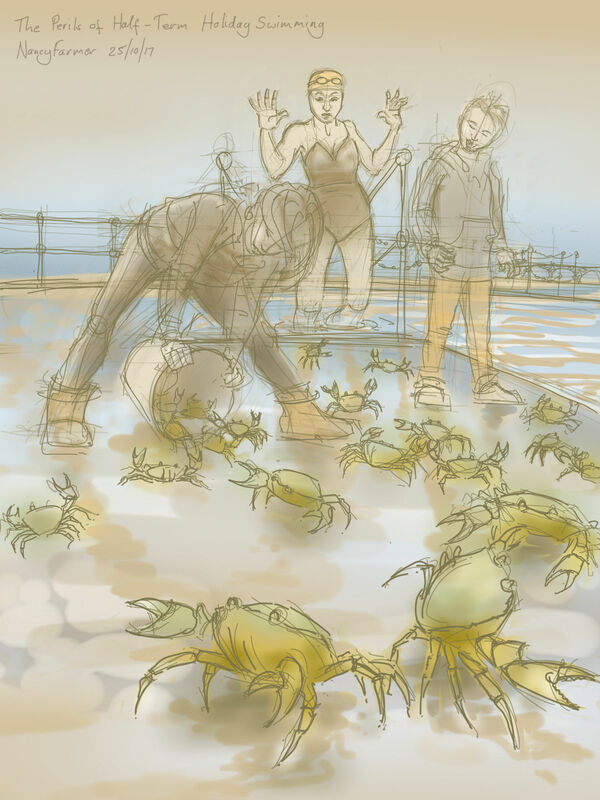 This entry was posted in showcase, swimming and tagged art, Clevedon Marine Lake, cold water swimming, crabbing, crabs, digital drawing, drawing, swimming on October 25, 2017 by Nancy Farmer. On Saturday I swam in Scales Tarn, overlooked by Blencathra, while a crocodile of people plodded on up the tricky way. The tarn was a beautiful azure blue, though in truth you had to be underwater to admire its colour, since the surface reflected the leaden sky. It was cold and wet, but outside of the tarn it was also wet, and quite slippery, and as the people filed past me on their way up Sharp Edge we eyed each other, both safe in the knowledge that the other party was the more foolish. 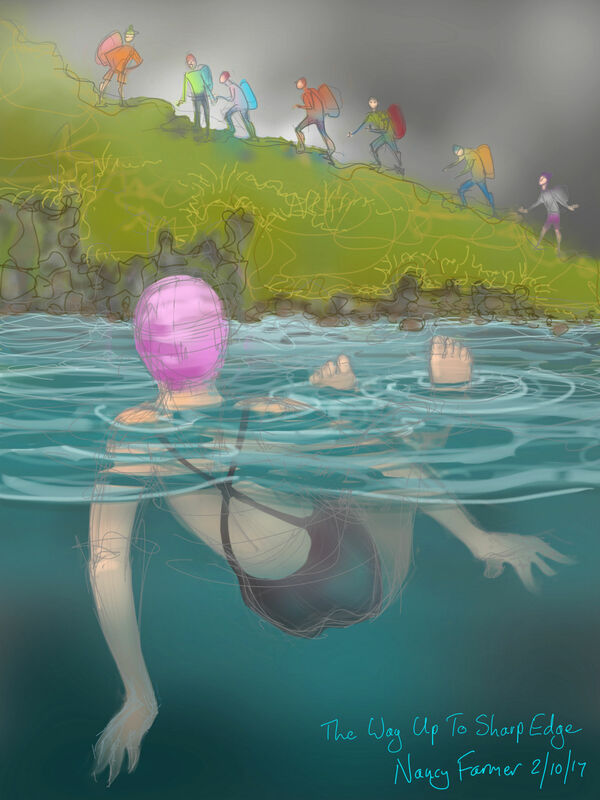 This entry was posted in showcase, swimming and tagged art, Blencathra, cold water swimming, digital drawing, drawing, Scales Tarn, Sharp Edge, swimming on October 2, 2017 by Nancy Farmer. I’ve been looking at some of my photos taken at Vobster Quay, of swimmers underwater. I take these as an aid to creating paintings and not as an end to themselves, but I thought I would share this with you. The movements of swimmers are always lovely, it’s the weightlessness, but I particularly liked this sweep down, a dive with two leg kicks. The camera is an Olympus Tough (orange, now obsolete, but there are newer versions), It’s very wide angle which makes the swimmers look quite far away and quite deep down, even if you see just one photo close-up. Click on the sequence and you should be able to see it in reasonable detail. This entry was posted in Photography, swimming, Uncategorized and tagged cold water swimming, Photography, swimming, Vobster, Vobster Quay on July 25, 2017 by Nancy Farmer. The BBC are on the beach again! It’s been a funny time down at Clevedon Beach. Suddenly you can’t go for a swim without tripping over a BBC camera man, so it was about time that a drawing appeared to commemorate it. 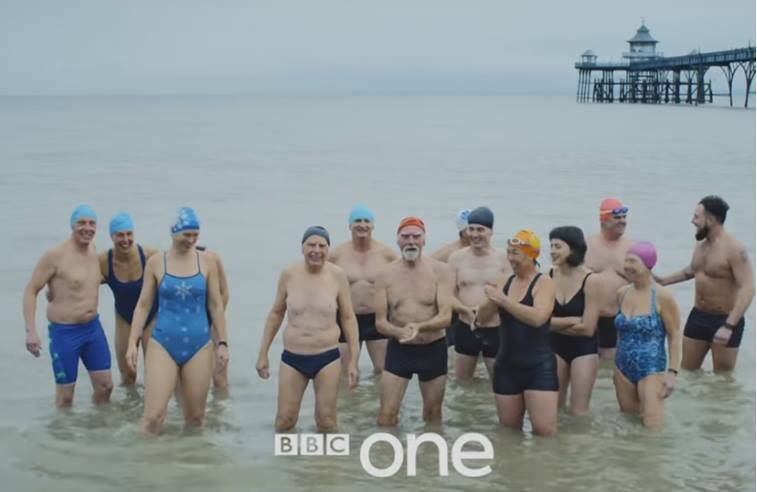 So far as I was involved, it all started when a request appeared on Facebook from the BBC for people to be filmed swimming in the sea, on a damp and grey Tuesday in late November. Paying very little attention to what the filming was for, this being the sort of thing that I was happy to do anyway regardless of camera crew, I happily agreed and toddled along on the appointed day. waiting for the BBC again… last Monday it was Countryfile. There was faffing. Much has been mentioned about the ability of cold water swimmers to faff, but let me tell you the combination of cold water swimmers and film crew pushed this to new heights. Which was just as well, since the appointed meeting time was 10.30am, with a high but neap tide due at 1pm. Not one but all 14 swimmers probably pointed out, individually and at various times when action looked like it was about to happen, that this meant that nobody was going to be able to get in the actual sea until getting on for 12. This is the Bristol Channel after all. The ‘sea’ must first come in, approaching Clevedon across sinking mud and rocks, and slow down a bit, before there is any question of actually getting in it. Time enough for bacon sandwiches, a second round of coffee, and a third check that none of us sported any trace of logos about our person. Time for a trip to the beach and back to the meeting room at the Pier, and back to the beach again. Whereupon I should say that the BBC, concerned for the welfare of their subjects, offered hot water bottles, in fluffy glittery coats (the water bottles had the coats on, the BBC also did, but they were not glittery). Anyway, to cut a long story short, I was a little surprised to find that come January 1st, I was in most of the newspapers and my bottom was all over BBC1, repeatedly, that we had been photographed by Martin Parr, a famous photographer, and that everyone I know had noticed. And the Twitterati were upset about the loss of hippos. It was slightly surreal. Since then we have had two more lots of BBC camera people getting us to re-create the scene, partly I think to prove that it wasn’t just a one-off and we really do swim all year. It looked just the same, except for a proliferation of gloves… it is January now, some small concession to the English climate is allowable. This particular drawing was inspired by Countryfile, on Monday of last week. Traffic on the M5 had meant I was nearly 20 minutes late, but fortunately the faffing was in full swing and I joined in like I’d been there all the time. 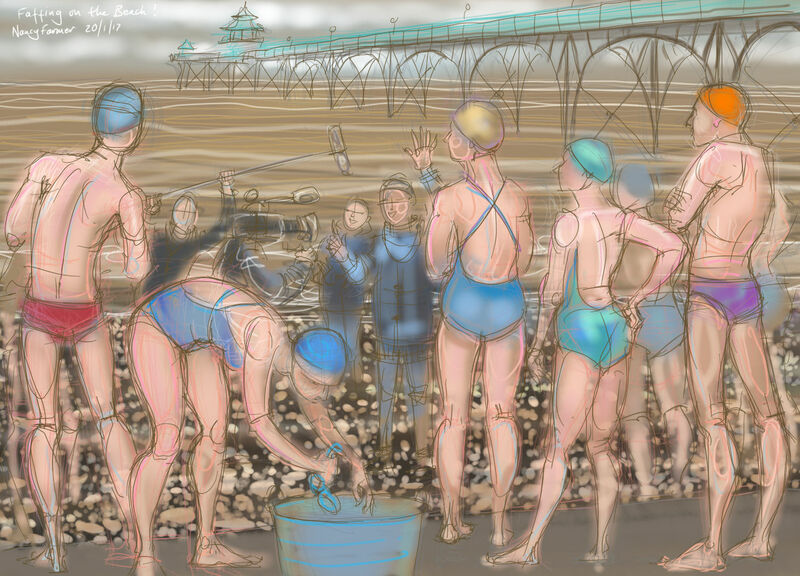 This entry was posted in Events, showcase, swimming and tagged art, BBC idents, BBC1, Clevedon, Clevedon beach, cold water swimming, drawing, faffing, open water swimming, showcase, sketch, swimming, swimming drawings on January 24, 2017 by Nancy Farmer. Quite unlike the Last Swim of 2016, the first swim of 2017 was a mass affair. More shrieking than swimming, especially from those who believe a new year’s resolution is all it takes, to get into 5 degrees as if you like it. They didn’t last. 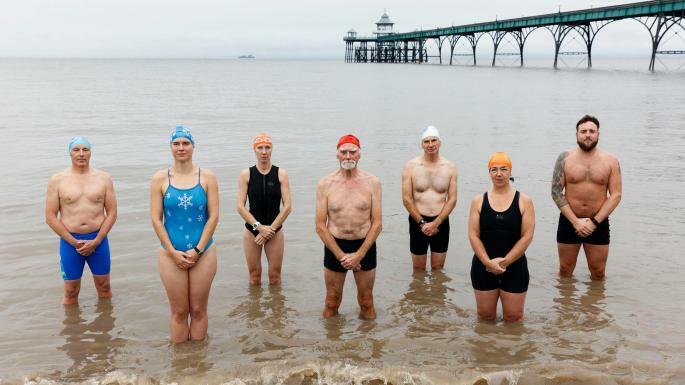 Though to be fair, some might: our Clevedon Lake and Sea Swimmers group is growing all the time, new faces popping up even through the winter and some of them stay, and surprise themselves. The local media was there too, and plenty of umbrella’d watchers. Determined to have a proper swim, I swam off to the far end, and by the time I got back it was all over. A stiff wind and a determined drizzle had blown a lot of them straight into the pub. 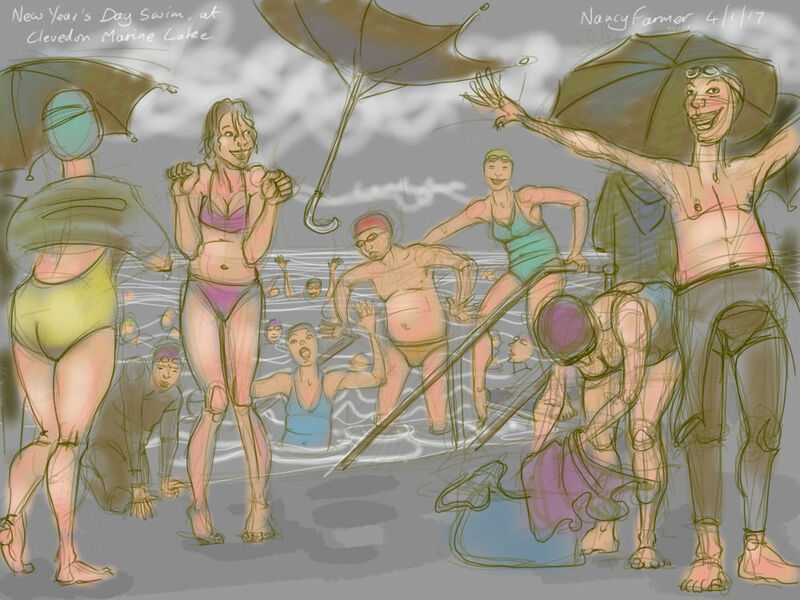 This entry was posted in Events, showcase, swimming and tagged art, Clevedon, Clevedon Marine Lake, cold water swimming, drawing, illustration, New Year's Day, open water swimming, showcase, swimming, swimming drawings on January 4, 2017 by Nancy Farmer.